When your slope is at risk for rockfalls, RocFall is there for you. Explore the energy, velocity, and bounce height of falling rocks and model remedial measures like barriers. See falling rocks in static reports or animate the rock path for a clear visualization of the rockfall. 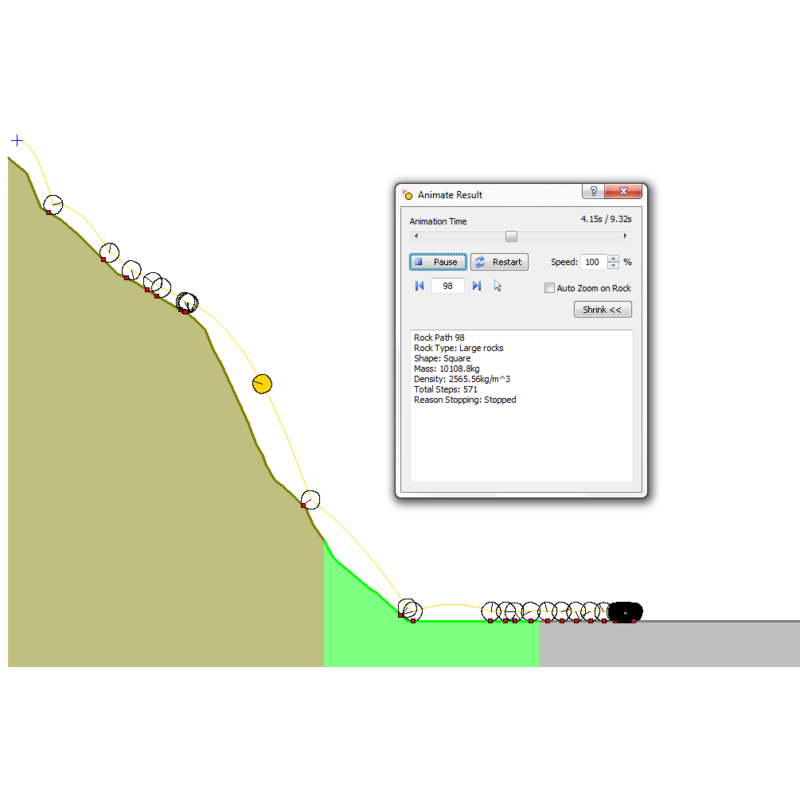 RocFall is a 2D statistical analysis program designed to assist with assessment of slopes at risk for rockfalls. Energy, velocity and "bounce height" envelopes for the entire slope are determined by the program, as is the location of rock endpoints. Distributions of energy, velocity and bounce height are also calculated along the slope profile. 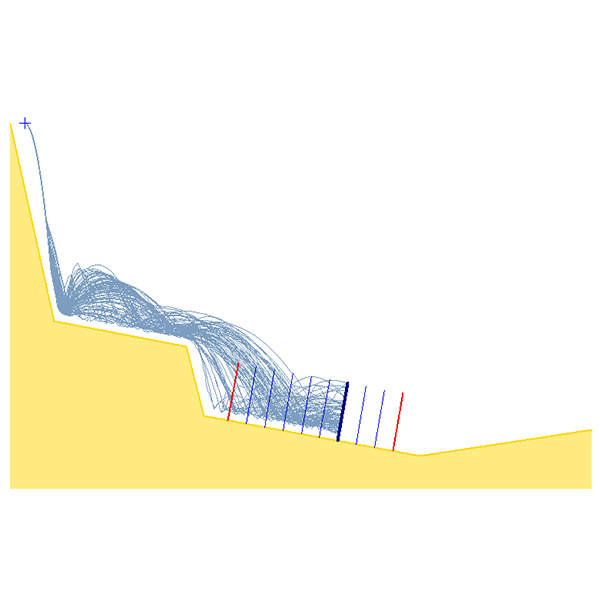 Distributions can be graphed, and comprehensive statistics are automatically calculated. RocFall allows the user to perform both lumped mass and rigid body rockfall analyses. RocFall can also assist in determining remedial measures: the material properties of each slope segment can be changed allowing for comparison of results. Information about the kinetic energy and location of impact on a barrier can help determine the capacity, size and location of barriers. RocFall also provides commercial flexible barrier information. Users can define a custom barrier or select one of the predefined barriers. Barrier sensitivity analysis allows the user to automatically vary the location, height, angle or capacity of barriers. RocFall allows you to create faster and easier high-quality output. Graphs can be exported to Excel with one click and the slope and rock-paths can easily be exported to a .dxf file for import into a CAD program. The Drawing toolkit has been improved to include importing of bitmap files, multi-line text-boxes that can be auto-filled with relevant simulation data, axes that can be dragged-and-dropped to show coordinates on a printed page and much more. Earthen berms were added to RocFall 2019 as a new rockfall mitigation tool. Using the Berm Designer dialog, triangular and trapezoidal berms can be added. Furthermore, custom berms can be created by specifying coordinates or importing coordinates from .csv or .dxf fles. Berms behave similarly to slope materials with normal and tangential restitutions and friction angles, or like barriers with infinite capacity. Geobrugg barriers were added to the RocFall 2019 pre-set barrier library. Additional improvements were made to the barrier design dialogs. Two new design guidelines/checks were added to RocFall 2019: Austrian guidelines (ONR 24810) and a series of unfactored checks. 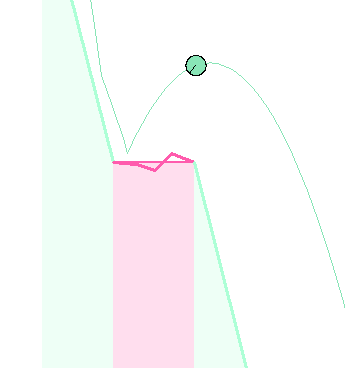 Impact angle plotting was also added to barriers and collectors to further improve the program functionality. 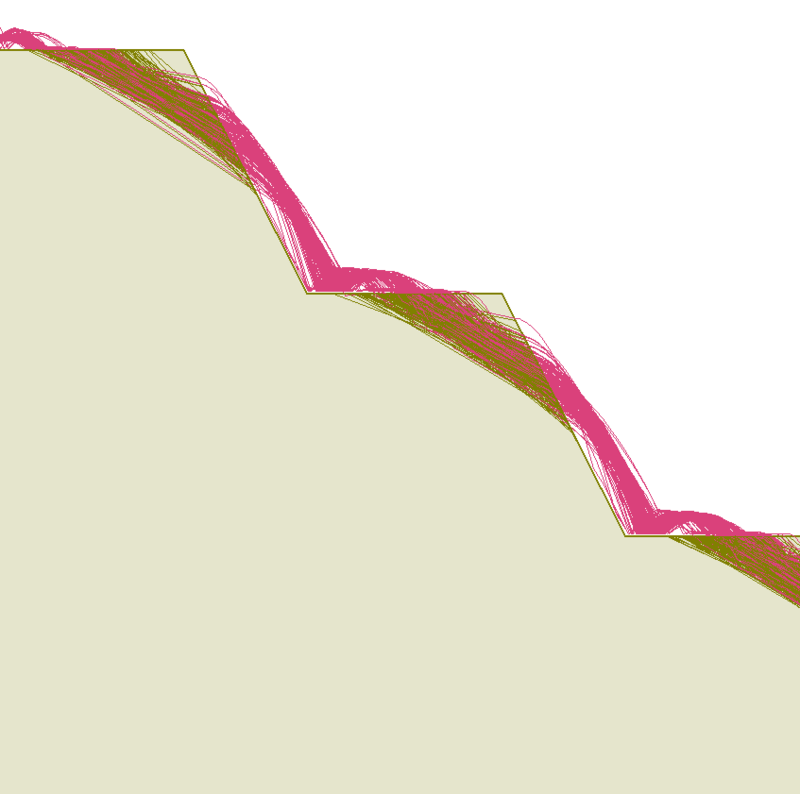 Previously, import functions were limited to slopes. 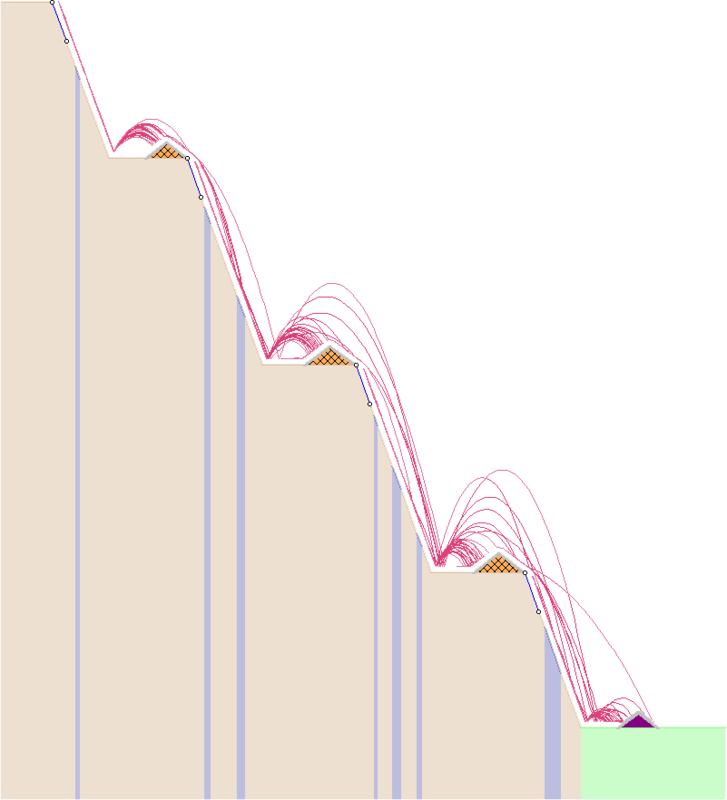 In RocFall 2019, all geometry can be imported. Furthermore, rock paths can be exported in dxf format. Model creation in RocFall is simple and straightforward for even the newest user. To begin, select the analysis type (lumped mass or rigid body). Then the slope can either be drawn manually with the cursor by inputting vertex coordinates, or be importing from .csv or .dxf files. Subsequently, you can use Seeders to determine the drop location for rocks. Finally, the user defines rock types (round, smooth, and polygonal) and material properties to be assigned to the slope. You’re now ready to view the results of your analysis, either in static form, or using the Animate Path function from the toolbar to view animated rock paths. The lumped mass approach is detailed in the Lumped Mass Theory document. The lumped mass engine uses a particle analysis with three sections: the particle algorithm, the projectile algorithm, and the sliding algorithm. The particle algorithm makes sure that the simulation parameters are valid, sets up the initial conditions, and starts the projectile algorithm. The projectile algorithm is used to calculate the movement of the rock while it is in the air. The sliding algorithm is used to calculate the movement of the rock while it is in contact with the slope. RocFall allows users to perform both lumped mass and rigid body rockfall analyses. The rigid body mechanics option comes with an extensive Rock Type Library, where users can choose the rock shape from the build-in library or create a custom polygon by inputting the coordinates or importing from a .csv or .dxf files. Rock types and properties are defined in the Rock Type Library. The rock properties that users need to define are mass and density. Statistical distributions can be assigned to each parameter. Users can use the Mass Calculation Tool to quickly calculate the mass of rocks based on the geometry of a sphere, cube, or block. The rock shape is defined in the Shapes pop-up window in the Rock Type Library. Users can easily preview each shape by clicking on the shape name. Using the checkboxes beside each shape, multiple shapes can be selected for each rock type. A "barrier" is a line segment (with one end on the slope surface) that can be placed anywhere along the surface of the slope to stop falling rocks or absorb some of their energy as they travel down the slope. The number of barriers users can place on a RocFall slope is not restricted. Barriers, however, cannot cross other barriers and cannot cross slope segments. Barriers can be added graphically, by entering the exact coordinates in the prompt line, or by entering the barrier height and angle in the prompt line. The Barrier Sensitivity Analysis allows the user to automatically vary the location, height, inclination, or capacity of rockfall barriers. 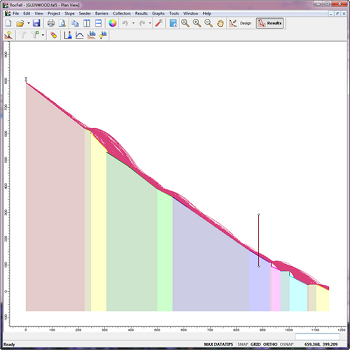 Results are plotted as sensitivity plots, allowing the user to determine the optimum location, height, angle, or capacity of rockfall barriers without the need to edit/re-compute multiple files. The user has the option to vary one or two variables at a time. Several commercially available flexible rockfall barriers are available in RocFall, including Geobrugg, Macafferri, and Trumer Schutzbauten barriers. Users can also define custom rockfall barriers. RocFall also features a Barrier Design Report, where users can specify design coefficients according to Italian or Austrian guidelines, or simply unfactored, and to validate the barrier design.